Kobe Sets Lakers Steals Record! With his one steal against the Clippers on Friday night, Kobe Bryant passed Magic Johnson for #1 on the team’s all-time career leaderboard with 1,725 thefts. If you’re interested in the seeing the team’s career steal leaders, then visit the Steals section on our Team Records page. The Lakers have officially listed the following listed as current injuries as of November 1, 2012. Bryant (foot) did not practice Thursday but will play Friday against the Clippers. Nash is officially listed as doubtful for Friday’s contest against the Clippers due to a lower left leg contusion, however Nash remains hopeful he will be able to play. 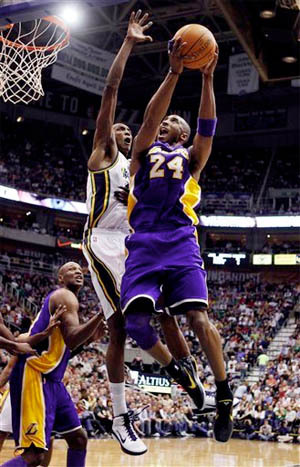 Kobe Bryant drives to the basket against the Jazz. For the first 24 minutes of Friday night’s game in Utah, it seemed like the Lakers were destined to give back the game they gained from Thursday’s nights hard-fought victory against Dallas. But these Lakers are just playing at a whole other level. The champs rallied from 17 points down, overwhelming the undermanned Utah Jazz in the second half, and scored a 96-85 at EnergySolutions Arena, their ninth straight win, and 17th in the last 18 games. 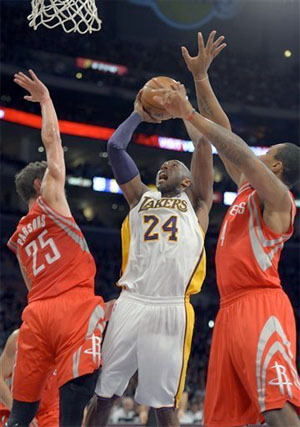 Kobe Bryant led the Lakers with 21 points and Lamar Odom and Pau Gasol each had 16. Gasol also added a team-high nine rebounds in the win. Utah jumped on the Lakers early, led 26-13 in the first quarter, and then put together an 11-0 run in the second quarter to build a 41-24 lead. But that’s when the tide began to shift. Los Angeles fought back with an 18-7 run to close the half, and trailed just 48-42 at the break. The second half was all Lakers, as Derek Fisher’s three-pointer finally got the Lakers even at 62 with just over four minutes left in the third quarter. Moments later they took the lead for good when Kyrylo Fesenko was called for goaltending on a Shannon Brown shot. The Lakers led 71-64 after three. The lead stretched to 83-65 early in the fourth, and the Lakers held off the Jazz the rest of the way for what turned out to be a fairly easy victory. Los Angeles outscored Utah 52-35 in the second half. Utah played without three of their key players, as Andrei Kirilenko, Devin Harris, and Raja Bell all missed the game with injuries. The Lakers played without Matt Barnes, who was suspended by the NBA for his role in Thursday night’s melee with Dallas. C.J. Miles, who had been in a shooting slump, scored 13 points in the first half for the Jazz, and finished with a game-high 24. Al Jefferson added 17 points and 10 rebounds, and Paul Milsap chipped in with 16 points. The Lakers shot just 39.4% from the field in the first half, but finished the game at 47.9% (34-71). They also held the Jazz to 41.5% (34-82) from the floor, and 2-10 (20.0%) from the three-point line. The Jazz did outrebound the Lakers 44-39, including 15-6 on the offensive end, but held a much bigger advantage (28-18) at the end of the first half. The win, combined with San Antonio’s sixth straight loss at Houston on Friday, brought the Lakers to within 1.5 games for first place in the Western Conference, with seven remaining. The Lakers’ current 17-1 record is the highest post-All-Star break winning percentage (.944) in league history. The Jazz are second, going 31-4 (.885) after the All-Star break back in 1997. The loss eliminated Utah from the Western Conference playoff race, marking the first time a team started 15-5 and 27-13 and didn’t make the playoffs. The Lakers now return home for a Sunday afternoon battle at Staples Center against the new-look Denver Nuggets, who have been playing very well since trading their superstar forward Carmelo Anthony last month. The two teams have split their two meetings this year, with the Lakers winning the last game 107-97 in Denver back on January 21.